Based on true events and laced with wry humor, Still Mine is a heartfelt love story about an 89-year-old New Brunswicker who comes up against the system when he sets out to build a more suitable house for his wife whose memory is starting to go. Although Craig Morrison is using the same methods his father, a shipbuilder, taught him, times have changed. Craig quickly gets on the wrong side of an overzealous government inspector, who finds just about everything unacceptable, including the unstamped wood Craig has milled from his own trees. As Irene becomes increasingly ill – and amidst a series of stop-work orders – Craig races to finish the house. Hauled into court and facing jail, Craig takes a final stance. Though they rarely get to take the spotlight, a good character actor can consistently elevate any film they're in, making even the smallest roles memorable and engaging. The movie industry is littered with many talented performers of this type, and the great James Cromwell is easily among the best. Known for supporting turns in everything from 'L.A. Confidential' and 'The Artist' to 'The Green Mile' and even 'Babe,' the veteran character actor always makes his presence known, and with 'Still Mine' he finally gets a chance to take center stage. Sensitive, poignant, and refreshingly understated, the film is a bittersweet drama that celebrates long-lasting love, even in the face of inevitable struggles, offering a multifaceted portrait of marriage through stellar performances from Cromwell and co-star Geneviève Bujold. Based on a true story, the film follows an elderly couple, Craig (James Cromwell) and Irene (Geneviève Bujold), who, after discovering that their large farm house no longer suits their needs, decide to build a smaller home. But as Craig sets out to construct the new house himself, he soon discovers that he needs a whole assortment of permits that he has not procured. As the government constantly hounds the man to comply with their standards, he continually ignores their claims, and soon runs into legal problems. Meanwhile, Irene's health begins to deteriorate and her memory starts to fail her. Determined to finish the house for his ailing wife, Craig will have to convince the government to let him continue, or risk losing everything he's worked so hard to create. Stripped down, sensitive, and leisurely paced, this is an elegantly crafted film that avoids overt drama in favor of gentler emotional beats. To this end, the majority of the runtime is simply dedicated to watching the old married couple live together as Craig struggles to simultaneously build their new home while dealing with Irene's fading memory. Likewise, Craig's son, daughter, grandson, and even great grandson also make appearances, helping him in his efforts, and these bonding scenes between the different generations are all handled with an understated sweetness. Less sweet, however, are the scenes between Craig and the government official who continually threatens to deride his construction. While he offers a decent enough foil, the character can be a little too one note and the conflict lacks much in the way of development, taking the plot in circles. Still, the house storyline gives the narrative a central drive, and works well to lend form to all of Craig's emotional hurdles, adding layers of subtext to every frustrated government standoff. Indeed, beneath the surface drama about the construction, the real conflict here involves Irene's declining health and the strain it has on the happy couple's relationship. Together, James Cromwell and Geneviève Bujold are a wholly believable old married couple, and their performances and chemistry are really what end up selling the movie. Watching them together is like watching two life-long best friends, and one can still see a palpable glint of love in their eyes whenever they glance at each other. Their simple heart-to-hearts and bedtime chats are among the highlights of the film, making the difficulties they face all that more painful to bear. Throughout it all, Cromwell's quietly nuanced and effortlessly multifaceted performance carries the picture, and his oscillating frustration, stubbornness, denial, and acceptance about Irene's limitations are all heartbreaking to watch. With that said, as strong as the central performances and subtle direction are, the script can be a little generic at times and the lack of plot developments and drama does lead to a few lulls in the pacing. Likewise, some of the supporting actors aren't as engaging, and the script could have used a few more insights here and there to help develop its themes about love and aging. Furthermore, while the movie mostly does an excellent job of avoiding drawn out sentimentality, there are a few moments that start to feel like a standard "Hallmark Channel" production, losing some of the authenticity that the main stars help bring to the runtime. Thankfully, these issues don't prove to be too troublesome, and Cromwell's remarkable performance helps to elevate the entire production, adding an extra layer of realism and emotion. 'Still Mine' is a modest, gentle movie that relies on sensitive insights and stripped-down drama. Somber and life-affirming, the film offers bittersweet insights on romance, marriage, and the natural toll of time, revealing a beautiful relationship in its twilight years that continues to endure despite hardships. 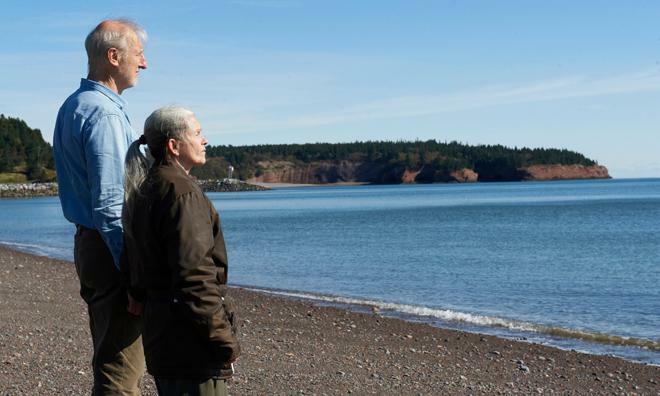 The pace does drag at times, and there are some dull stretches, but director Michael McGowan's approach is always heartfelt and star James Cromwell turns in one of the most impressive performances of his increasingly storied career. Though mostly overlooked outside of its native Canada, this is a sweet and delicately affecting film that fully earns its unassumingly tear-jerking finale. 20th Century Fox brings 'Still Mine' to Blu-ray on a single BD-50 disc that comes housed in a keepcase along with instructions for an UltraViolet digital copy. After some logos and skippable trailers, the screen transitions to a standard menu. The packaging indicates that the release is Region A coded. The movie is provided with a 1080p/AVC MPEG-4 transfer in the 1.85:1 aspect ratio. Crisp and wonderfully detailed, this is a surprisingly beautiful transfer that suits the material very well. Shot on the Arri Alexa, the digital source is essentially pristine and, outside of some fleeting shimmering, the transfer is completely devoid of any pesky artifacts. Clarity is sharp, with a great sense of fine texture in backgrounds and characters (James Cromwell's weathered face and white stubble are especially striking). The color palette mostly sticks to cooler tones with a lush blue and green cast, and all of the hues are vibrant and nicely saturated. Contrast is high with bright whites that don't bloom and deep blacks with solid shadow detail. Marked by a clean and impeccably textured image, 'Still Mine' comes to Blu-ray with a handsome video transfer free of any major problems. The film is presented with an English DTS-HD MA 5.1 mix along with English, Spanish, and English SDH subtitles. Delicate but still spacious, this is a modest yet effective track. Dialogue is clear and precise throughout with no balance problems or technical issues. The soundstage offers a solid sense of space and location, spreading an appropriate air of nature atmosphere around the room. Crickets and birds are especially prominent, layering in a subtle level of texture and gentle nuance throughout the track with decent directionality. Low frequencies are negligible, but the musical score has good range. There isn't much to the audio here, but the delicate sound design works well with the modest subject matter, and the mix offers a pleasing sense of ambiance. Unfortunately, there are no supplements included. 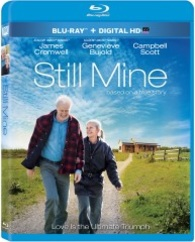 'Still Mine' is a sensitive and emotionally affecting portrait of elderly love, joys, and hardships. 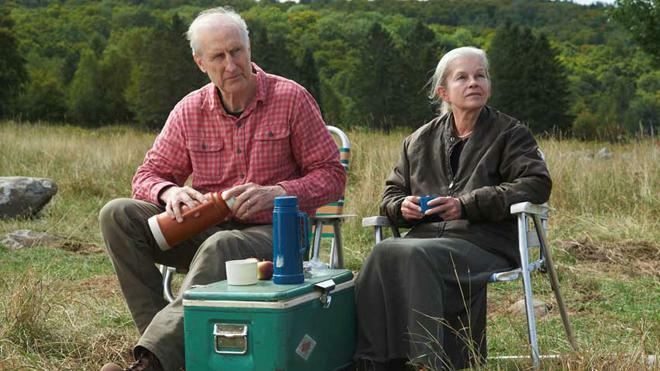 Though the pace can drag in spots, and the plot can be a little generic, James Cromwell turns in a fantastic performance, and the director taps into some insightful themes with a very deft hand. The video transfer is surprisingly impressive and though subtle, the audio mix is very solid. Sadly, we get no supplements, but the film itself is certainly worth a look.